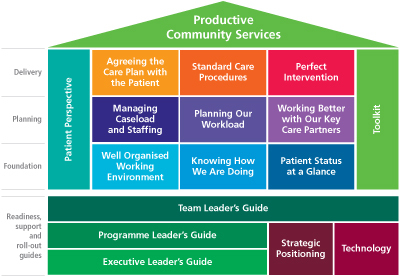 The Productive Community Services programme is a scalable, team-based application of Lean in community care based settings. It is aimed at teams delivering care outside hospital, normally in patients' homes. The modules build from the bottom up and from left to right. Click on the relevant section of the Productive Community Services house (above). The Planning modules will be available soon. Please re-visit this page then when more information will be available. The Delivery modules will be available soon. Please re-visit this page then when more information will be available. To order a box set of Productive Community Services modules you must register and then visit the following page of the catalogue.